Hi, my name is Barbara Swetina. I am a musician and I have lived in the Findhorn Community since 1984. I love getting people together to sing. In my experience it is one of the fastest ways for a group of people to connect with Spirit and with each other. Through my life in the community I meet a wide variety of people from many backgrounds and therefore I have had the chance to learn songs from all over the world. Many of my favorite songs were recorded here in the community. In my heart I see a singing planet, many people gathering in different places on the globe to sing, dance and pray together. In so doing sacred space is created, moments where we are reminded of the love and harmony which is our essence and birthright. I love setting up such spaces here in Findhorn. Traveling I meet fellow troubadours and artists and we create such events together. Inspired by the Taizé community in France, I have started a practice called Taizé singing in Findhorn. We start every day with half an hour of devotional singing in the morning. Great for opening the heart! I am part of the Findhorn Foundation's Outreach faculty and teach workshops all over Europe as well as internationally (Australia, Brazil, Hawaii, Japan, Russia and the USA). 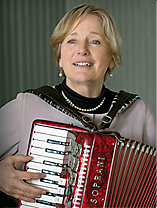 I play many instruments (piano, accordion, flute, recorders, guitar and harp), have a wide repertoire of songs and dances & I really enjoy teaching.